Illustration of phenotypic differences between domestic and wild rabbits including changes in the size of the amygdala and the medial prefrontal cortex. An international team of scientists has used high-resolution magnetic resonance imaging (MRI) to study how domestication has affected brain morphology in domestic rabbits. The results show that domestication has had a profound effect on brain morphology in particular regions of the brain involved in fear processing, the amygdala and medial prefrontal cortex. The study is published in PNAS. In contrast to domestic rabbits, wild rabbits have a very strong flight response because they are hunted by eagles, hawks, foxes and humans, and therefore must be very alert and reactive to survive in the wild. In fact, Charles Darwin wrote in On the Origin of Species that “…no animal is more difficult to tame than the young of the wild rabbit; scarcely any animal is tamer than the young of the tame rabbit”. There is no doubt that this type of differences in behaviour between wild and domestic animals to a large extent are genetically determined. 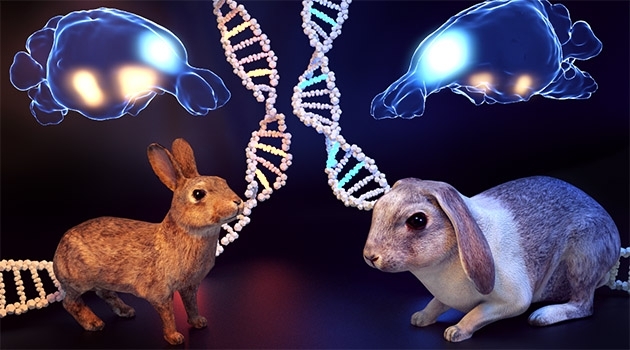 “In a previous study we reported that genetic differences between wild and domestic rabbits are particularly common in the vicinity of genes expressed during brain development,’ explains Miguel Carneiro, from CIBIO-InBIO, University of Porto, one of the leading authors on the paper. ‘In the present study we decided to use high-resolution MRI to explore if these genetic changes are associated with changes in brain morphology,” says Miguel Carneiro. The scientists raised eight domestic and eight wild rabbits under very similar conditions to minimize changes due to environmental effects. Furthermore, the brain MRI data were interpreted with sophisticated image analysis in which the scientist carrying out the analysis was unaware of the status animals (wild or domestic). “This study is not only important for our understanding of animal domestication but also for the basic understanding how variation in brain morphology can impact a complex behaviour like fear response,” ends Leif Andersson.